Crock Pot Creamed Corn is a delicious, easy side dish that everyone will love! It’s great for any occasion, any time of year. You’ll definitely want to keep this recipe on hand! We love Crock Pot recipes, and this one is no exception. Some of our favorites include Slow Cooker Mexican Meatloaf and Slow Cooker Mississippi Roast. This recipe would be a great side for both! You might have tried the canned creamed corn from the grocery store somewhere along the line. It’s ok, but it’s not anything to write home about. If you’ve never tried real creamed corn, though, oh my word. You are in for a treat! Crock Pot Creamed Corn is so darn good that there really isn’t a recipe name that can do it justice. 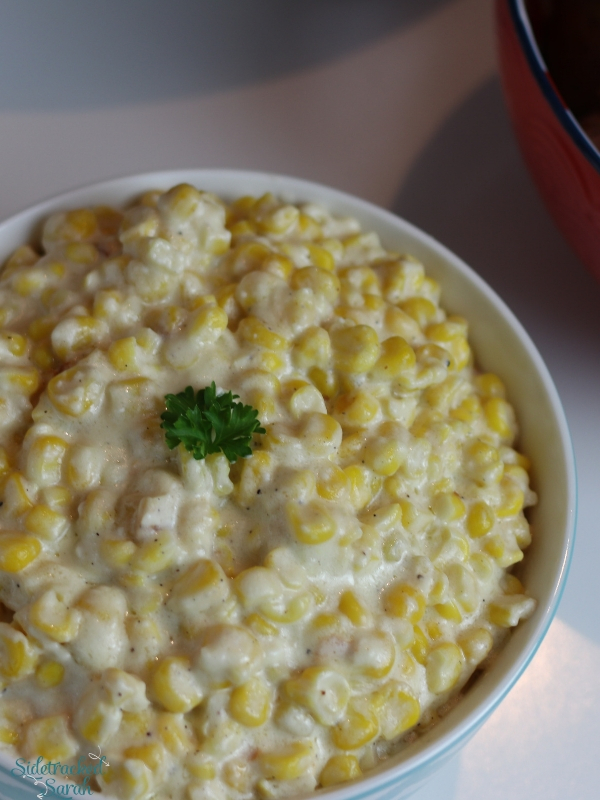 It’s a little sweet, a little savory, and has just the right blend of creamy sauce and tender-crisp corn. It’s also really easy to make – the Crock Pot does all the work for you! DOES IT MATTER WHAT TYPE OF CORN I USE IN CROCK POT CREAMED CORN? I prefer to use frozen corn for this dish, since it’s easy, inexpensive, and keeps its texture when cooked. You can use canned corn (be sure to drain it first), but it will have a softer texture. If you happen to have a bunch of fresh corn on hand, feel free to cut it off the cob and use it in this recipe! CAN I ADD ANY ‘EXTRAS’ TO CROCK POT CREAMED CORN? Personally, I think this recipe is just about perfect just the way it is, but if you’d like to jazz up your dish, feel free! You can easily add in “extras” like cooked bacon or sausage, green onions, or a bit of shredded cheese. It’s so versatile that you can make it any way you like! I recommend trying the recipe “as is” at first, though – I think you’ll love it as much as we do! 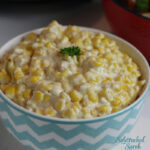 WHAT SHOULD I SERVE WITH CROCK POT CREAMED CORN? 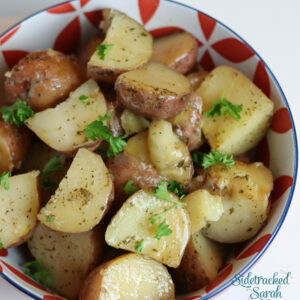 This delicious side dish goes with just about everything, and it’s easy enough to make any time! Some of my favorite recipes to serve it with include Slow Cooker Honey Barbecue Beef Brisket, Instant Pot Lemon Pepper Turkey Breast, and Delicious Slow Cooker Beer Brats. 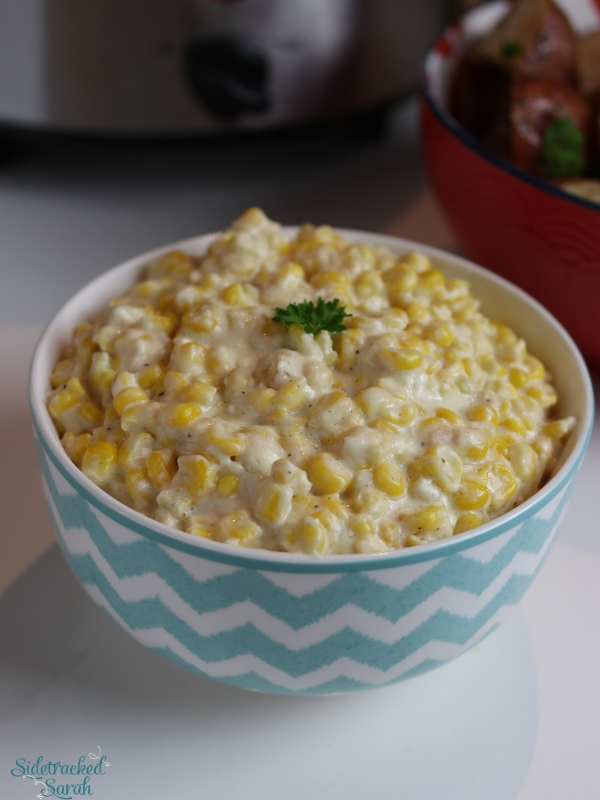 Whatever you choose to serve it with though, Crock Pot Creamed Corn is sure to become a family favorite! WANT MORE EASY CROCK POT RECIPE IDEAS? Stir in milk, sugar, salt and pepper. 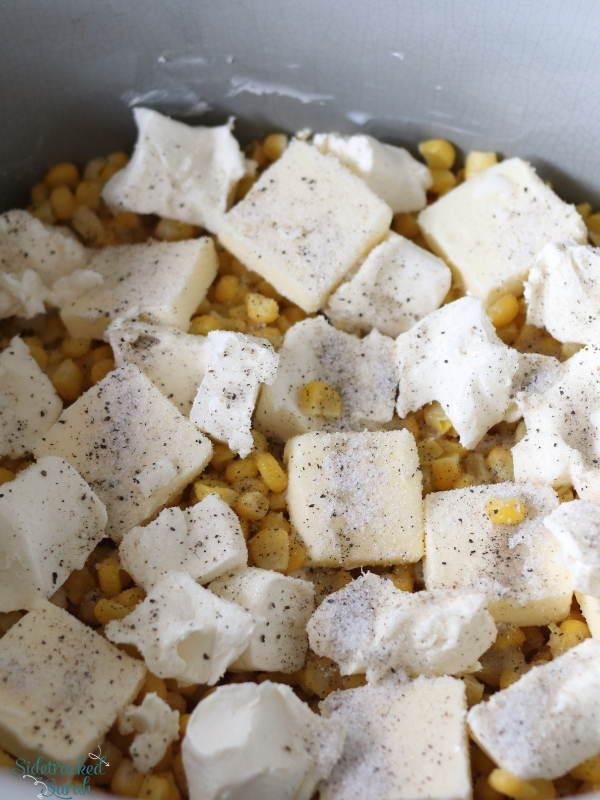 Slice butter and cream cheese and place them evenly over the top of the corn. Cook on low for 4 to 6 hours or high for 2 to 3 hours. This past week at our weekly homeschool co-op, my 10 year old daughter was able to go to our local community college where we have what is called a Fab Lab. 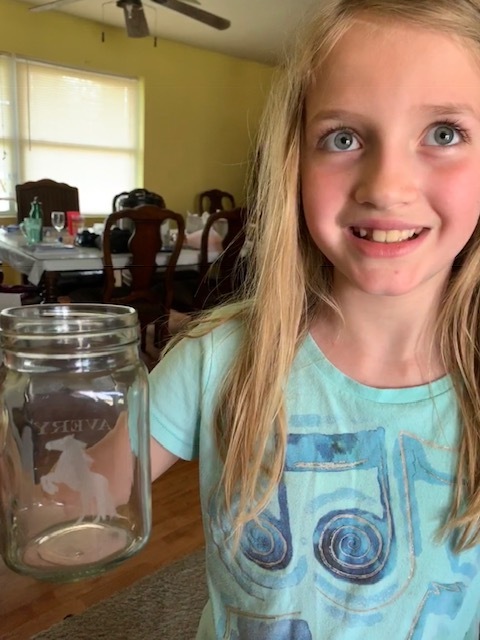 She was so excited that she got to etch her own glass. First she designed it in Corel Draw and then took it to the machine to have it etched on. She of course put a horse on it. One of her favorite things in the whole world!